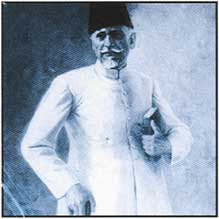 Former president of Indian National Congress and a renowned religious scholar Abul Kalam Azad (1888-1958) spoke to multitudes of devastated Muslims in the grand mosque of Delhi on October 23, 1947. Unlike Nawab Ismail Khan (see Aligarh Address), Maulana Azad made no reference to recent history. He put his listeners to shame for having voted against his political party - almost declaring communal violence to be justifiable revenge of a powerful majority. Traumas can erase memory, and such messages from rulers at that time may have contributed to a sudden loss of pride among Indian Muslims in co-creating the largest Muslim state. Think for one moment. What course did you adopt? Where have you reached, and where do you stand now? Haven’t your senses become torpid? Aren’t you living in a constant state of fear? This fear is your own creation, a fruit of your own deeds. It was not long ago when I warned you that the two-nation theory was death-knell to a meaningful, dignified life; forsake it. I told you that the pillars upon which you were leaning would inevitably crumble. To all this you turned a deaf ear. You did not realize that, my brothers! I have always attempted to keep politics apart from personalities, thus avoiding those thorny valleys. That is why some of my messages are often couched in allusions. The partition of India was a fundamental mistake. Shah Ahmad Madani and the alternative of composite nationalism? Thanks for posting this speech. It is so poignant. The wisdom of Maulana Azad is pouring from every letter that he uttered on that momement. Maulana Azad was indeed the greatest visionary of the previous scentury. Allas! We, the Muslims, particularly, did not follow his vision that is why we lost our track. Maulana Azad is one of the most neglected scholar, statesman, and thinker of the recent Muslim history. His words and action were in conformity. @Syed Hanif Rasool: it is unfair to demand from the Muslim community that it should follow anybody's personal opinion instead of its own collective decision :-).